Obituary – Taylor, Billie Irene (Boyer) « Perry High School Alumni Association, Inc.
– daughter of Dr. and Mrs. 0. W. Boyer, was born in San Antonio Texas. She has attended all her years of school in Perry. While in Perry High School she was a member of the band, a character in the freshman play, has a perfect attendance record for 12 years and is a member of the National Honor Society. She would like to be a librarian, having worked in the Public Library in Perry for a year and half. She is planning on going to college next year or the year following. Billie B. Taylor, 89, died Saturday, June 14, 2008, in Perryton, TX. Services will be at 2 p.m. Tuesday in First United Methodist Church with Dr. Ed Williamson officiating. Burial will be in Ochiltree Cemetery by Boxwell Brothers Funeral Home of Perryton. Billie was born Oct. 3, 1918, in San Antonio. 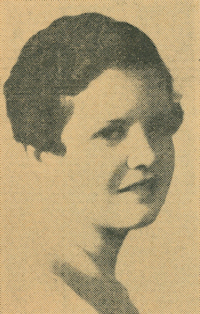 On June 2, 1942, she married Charles Frederick Taylor in Perry, Okla.
For more than 41 years, she was co-owner of Taylor Pharmacy in Perryton. She graduated from University of Oklahoma and also was a member of Beta Sigma Phi. Mrs. Taylor enjoyed working in the public library in Perryton, her bridge club and also enjoyed traveling overseas, and visited many countries in her travels. She was preceded in death by her husband in 1993. Survivors include a daughter, Terri Pletcher and husband John of Canyon; a grandson, Tanner Pletcher of Austin; a granddaughter, Taylor Pletcher of Canyon; two brothers, Boyd Boyer of Wichita, Kan., and Bernie Boyer and wife Nell of Elk Grove, Calif.; and several nieces and nephews. The family suggests memorials be to American Red Cross, 511 S. Main St., Perryton, TX 79070; First United Methodist Church, P.O. Box 987, Perryton, TX 79070; or Season Assisted Living Center, 401 S.W. 24th Ave., Perryton, TX 79070; of Museum of the Plains, 1200 N. Main St., Perryton, TX 79070.